The 3D platformer, the faded genre of Super Mario 64 that flourished two decades ago, was supposed to finally make a comeback in 2017. The likes of Yooka-Laylee and Super Mario Odyssey were going to bring it back. 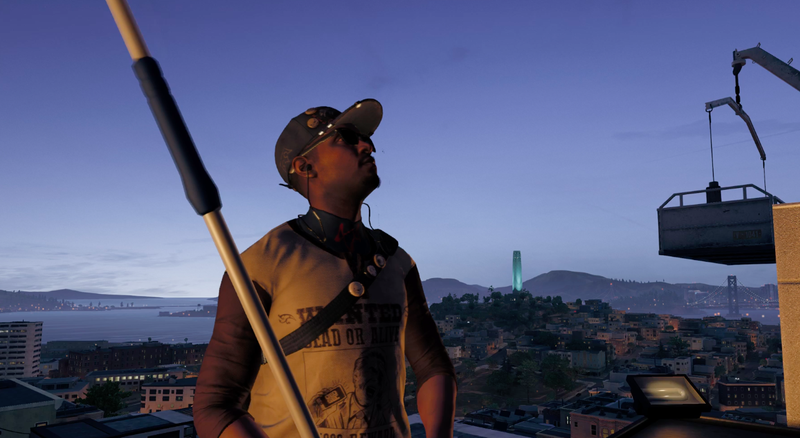 But Watch Dogs 2, of all games, snuck some 3D platforming into its side missions last year, using one key design twist to refashion how these kinds of games works. You might not have thought of Watch Dogs 2 as a 3D platformer, let alone an innovative one. It’s one of those massive open-world Ubisoft games that’s bursting with hundreds of things to do. You could surely think of it in many ways. It’s a third-person shooter. It’s an ATM-hacking simulator. It’s a game that turns the underside of the Golden Gate Bridge into some sort of line-connecting puzzle. It’s an interactive fashion show. It’s a complex delivery system for providing a new take on whether the Aliens can beat the Predator. It’s a game about taking selfies. Its an elaborate teaser for another Ubisoft game. It’s even a game that pulls you into other people’s games so you can join the police and chase them! But, yes, Watch Dogs 2 is also an innovative 3D platformer. That’s due to two things: 1) a design philosophy that treats climbing up to a distant goals as a mystery that needs to be physically solved and 2) the inclusion of a surveillance drone that players can toss into the air and commandeer at any time in order to solve that mystery before their character even takes a step. Even the original 2014 Watch Dogs included a lot of 3D platforming. Much the way Mario 64 made a challenge of summiting a mountain ruled by a Bob-omb king, the first Watch Dogs made a climbing puzzle out of climbing onto crates and then rooftops across the Chicago skyline. The late 2016 sequel makes a jungle gym out of a virtual recreation of San Francisco, once again enticing players to get onto roofs to grab collectibles and once against challenging them to figure out how to get there. Many 3D platformers are designed with the assumption that you’ll just push your character on through, taking on each challenge and clambering over each obstacle as it presents itself, much like a person climbing a mountain without planning ahead. Watch Dogs 2 is hostile to that approach. It intentionally befuddles you about how to get to high ground and requires you to do some research first. The loop starts with a discovery of your goal. You’ll run through virtual SF and notice there’s a collectible or optional quest objective that the game’s designers plopped onto a roof. You’ll stop whatever else you’re doing, point the camera toward that collectible and wonder how in the world you can get up there. That’s the mystery. For example… you might be standing outside the game’s fake version of Google headquarters. You might then notice they’ve got some money on their roof. That’s what a blue diamond with a dollar sign means, of course. A sensible player will run around the building, trying to find a way up there. Maybe those concrete blocks below the floor to ceiling windows are the first steps in this roofward climb. Maybe there’s a way to scale a nearby tree? Keep running around and you might notice, way off in the background, that there’s a slanted roof. Hmm. This is the kind of platformer Ubisoft has designed into Watch Dogs. Think of it not just as a 3d platformer or even as a so-called puzzle platformer but as a surveillance platformer. You’re expected to look around, find a path, and then take it. Thanks to your drone, you don’t even need to do this surveillance on foot. And thanks to that drone, Ubisoft’s designers can design platforming mysteries on a grand scale that stretches across multiple city blocks over which your drone can fly. Here’s the game’s protagonist, Marcus Holloway, near San Francisco’s famous, windy Lombard Street. The mini-map shows that there’s an orange sidequest objective nearby. It’s on a roof, really high up. If you have Marcus run up and down the street, you won’t find an easy way for him to climb to that orange icon. But, if you have Marcus switch to his hacker vision and, even better, toss out his aerial drone, you’ll spot a lift nearby. The problem is that the lift doesn’t descend to Marcus’ level, so even though you can hack it and lower it, Marcus can’t reach it. The bigger problem is that there is nothing along Lombard Street that Marcus can climb that will get him to that lift. You know this not just because you can run Marcus all around the block, but because you can more swiftly fly his drone around and over the block. As you do—as I did in the clip captured below—you’ll begin to notice that the roofs near your goal seem to define a pathway. You can even look at your destination on the rooftops and begin to work things out in reverse: to get to the lift, I need to be on the nearby roof with the gazebo… to get to that roof, I can climb over from the roof that has a ladder leading to a lower building... now there’s a hot tub nearby and maybe I can use that? Maybe not? The Watch Dogs 2 game world is full of challenges like this. As you run and drive through the game, your map will keep showing you the collectibles and quest objectives that you can reach, but the challenge repeatedly involves figuring out how to reach them and the solution, consistently, is to fly around, surveil the scene and find the path hidden in the urban grid. Because these challenges blend in with the geography, they don’t have an obvious origin point. They’re subtle taunts directed at your platforming skills and your powers of deduction. I’m not sure what Ubisoft is going to do next with their Watch Dogs series. It’s a franchise that has had an identity crisis almost since day one and even I’m not sure if I’d enjoy these games more if they were more hacker-heavy, less hacker-heavy, more serious, less violent, more playful or what. I do know that I like this version of 3D platforming that the game’s designers have concocted.